Posted on April 15, 2019 by Ching under Things to Do, Travel. After Moonshine Grill, we walked over to Maggie Mae’s which calls itself the most iconic bar on Sixth Street. 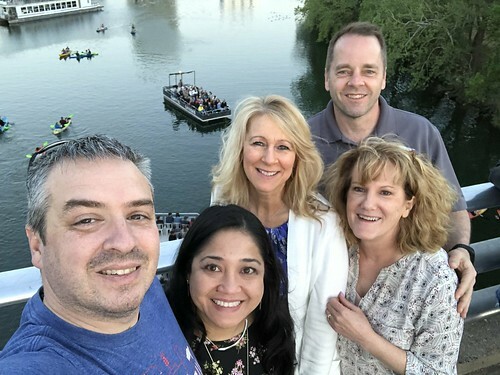 We were there with the OUUG conference group just the previous night but Brian had never been and I wanted him to be able to experience it. 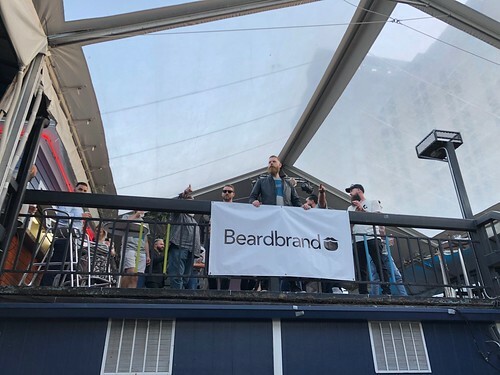 Plus, I found out about the Beardbrand customer appreciation party so I thought it would be a good way to get free drinks. I couldn’t believe I managed to talk four others into crashing the party with me. As always, Brian (who is a bit of a stick in the mud) was a very reluctant participant. 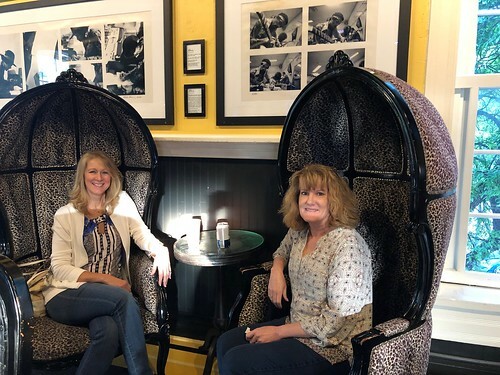 Lois and Michelle at the Beardbrand party at Maggie Mae’s. 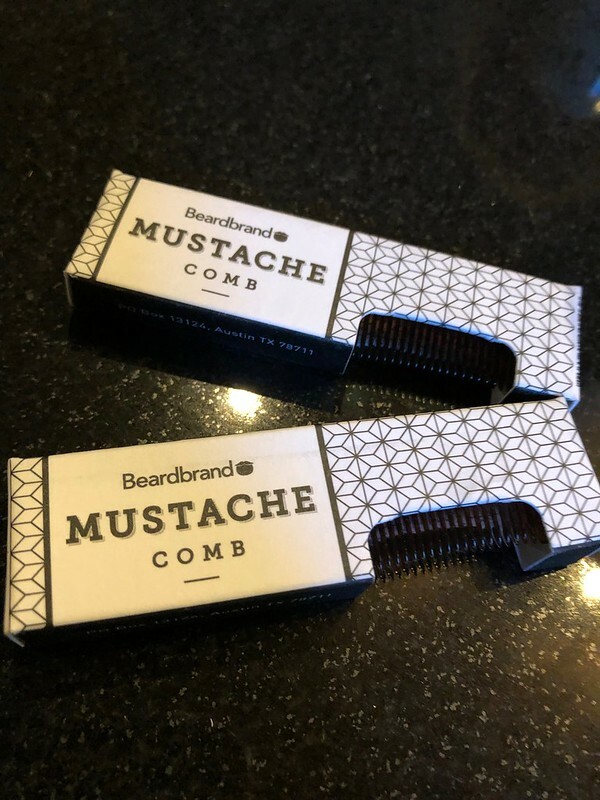 They had these little mustache combs in a bowl for everyone to take so I took a few for my bearded friends in Wichita. We could have stayed and drank for free all night but we had to be at the bridge by sunset to watch the bats, which Brian had never seen before, so we only had time for a drink. As we were leaving, they were rounding everyone up for a group photo. I really wanted to be in it but party pooper Brian wouldn’t let me. I guess he was still feeling really awkward about crashing the party. LOL. We arrived at the bridge just as people were gathering both on land and in the water. 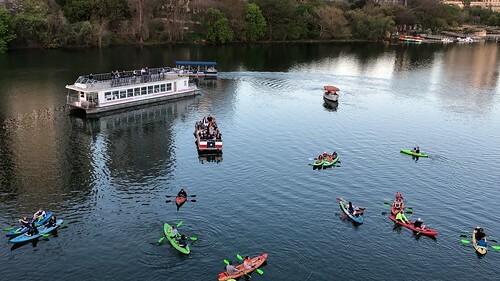 They were in paddle boards, kayaks, paddle boats, and tour boats of all shapes and sizes — pretty much anything that floats. 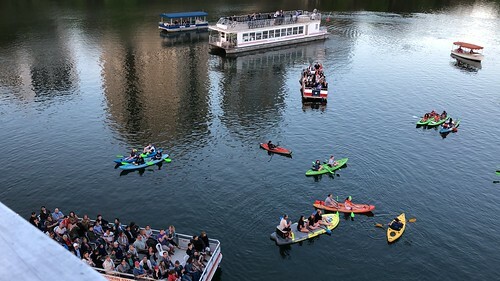 I suppose the water is the perfect vantage point for viewing the bats as they emerge from their roost under the Congress Avenue bridge. Our group decided to stay and watch from the bridge. It worked for me because Jackie and I watched them from the grassy area under the bridge the night before. She wanted to see the bats so I went with her and we both left the OUUG party at Maggie Mae’s early. This is the spot where Jackie and I watched the bats. 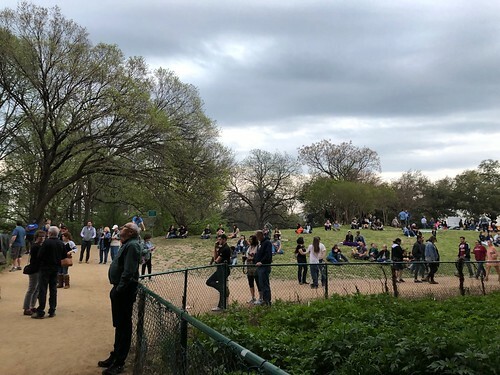 It’s a very popular bat observation spot. 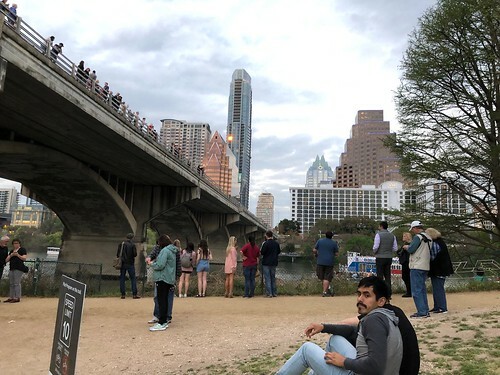 However, as you can see, people watch the bats from the bridge and also from the river. Here’s a short video the bats emerging from their roost. They are very small and difficult to see. I was actually quite surprised. I thought they’d be much larger. 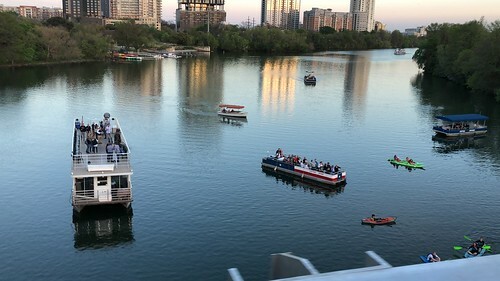 Here’s a video of us viewing the bats from the bridge, which I think is actually much better because it’s easier to see the bats. However, I think watching them from a boat on the water would probably be best because you’d be even closer. 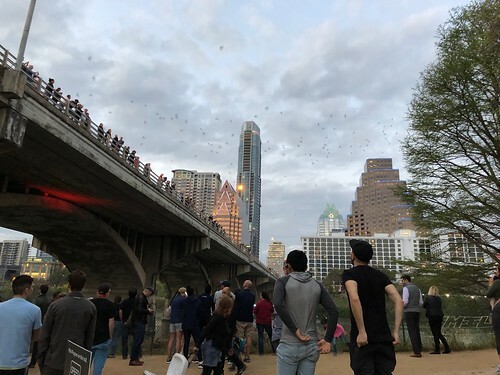 The bats start flying out of the bridge at sunset. The whole event takes several minutes and continues until dark. When Jackie and I left that first night, there were still many bats emerging but it had gotten quite dark and we could barely see them at that point and so we decided it was time to leave and head back to our hotel. It’s really interesting to watch the bats. I can see why it’s a tourist attraction. The main thing to remember is not to touch the bats if you see them on the ground as the sign below says. 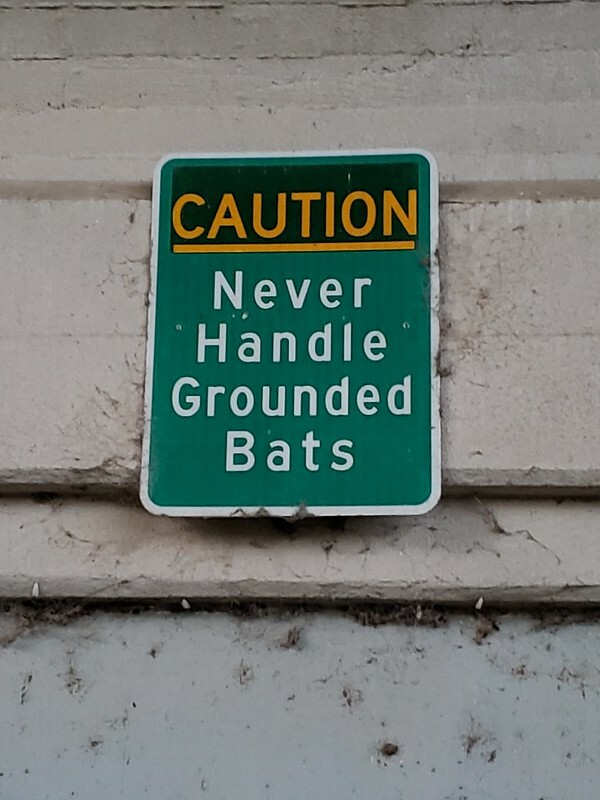 I didn’t encounter any grounded bats on either night. That’s a good thing. I would have felt very bad for them. Anyway, Brian and I decided to call it a night after the bats. He didn’t get in until almost three o’clock that morning due to flight delays. He was supposed to arrive shortly after ten and at the hotel by eleven o’clock. Luck was not on his side that night. He had a rough trip. We both turned in early to allow Brian to catch up on much-needed sleep. That’s all for now. GNG.